For connectivity at the device level, B+B SmartWorx powered by Advantech unmanaged Ethernet switches bridge sensors, motors and drives to the Ethernet network. 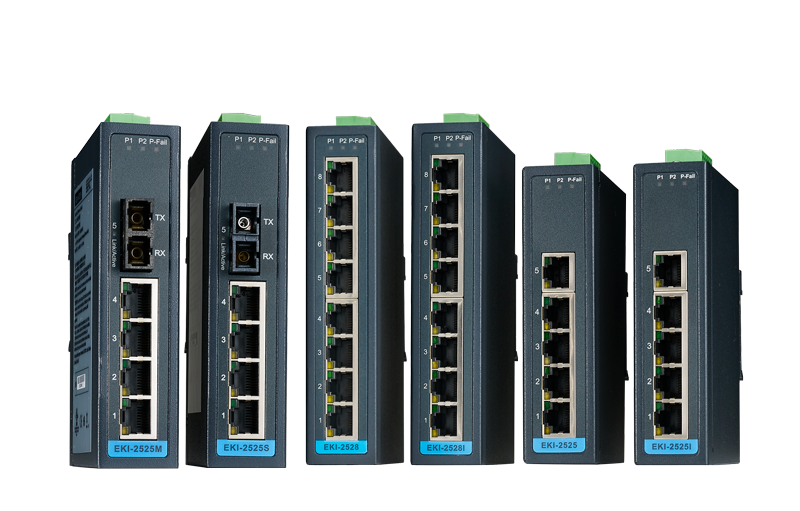 The most cost-effective on the market with a wide range of capabilities, we have the right unmanaged switch for you. From simple plug-and-play to light managed, all unmanaged industrial Ethernet switches include the following benefits: a rugged industrial design, energy-saving capabilities and multiple industry certifications. Additionally, our Power over Ethernet (PoE/PoE+/PoE++) switches offer the widest range of power inputs, including 12v and 24v options. Inexpensive, versatile and dependable, the EKI-2000 Series unquestionably is the best value plug-and-play unmanaged switch. In addition to a great price, its slim design saves DIN rail space for both the 5 and 8 port models. Dual Power inputs and mounting options deliver versatility. Unlike other switches in its class that just talk tough, the EKI-2000 backs up our claim of “rugged dependability” with Industrial specs. What makes this “little round one” special is its unusual compact size. The ADAM-6520 Series offers unmanaged switching power that fits in the palm of your hand. Although it’s small in stature, ADAM switches are big on adaptability. While other switches are DIN rail mount, the ADAM is a panel-mount switch, which means you can put it almost anywhere, and its features include a stackable option. Great things do come in small packages. These little workhorses come in hardened cases that mount 7 different ways and feature broadcast storm protection and dual power inputs so you can run them on AC or DC power. Out of the box, EKI-5500/5600 models are exceptional unmanaged switches but also bridge the managed/unmanaged gap. Simply download free iView2™ software and you have basic network monitoring and management capabilities. Additionally, the EKI-5500/5600 Series is the first to earn the 802.3az Energy Efficient Ethernet certification, saving you up to 60% on power usage. iView² is an Simple Network Management Protocol-based element management software provided free-of-charge with all our intelligent FTTx, Optical Access, Media Conversion and eWorx Smart Industrial Ethernet Switch solutions. Learn more about iView2.